I first met Terry Pratchett in the form of is book Guards! Guards! I was 17, just about to finish high-school and I was hanging in a library in Pinerolo, a picturesque little city surrounded by the Alps. 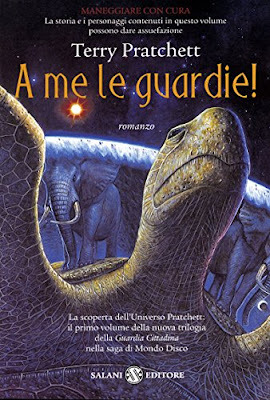 The library was called Volare (= to flight) and at the time I was constantly checking its sci-fi & fantasy section and several times I wondered about a weird book with a turtle flying in deep space on the cover. One day, having some time to wait before the next bus home, I started reading the first chapter. Fifteen minutes later I bought the book. I continued to read it on the bus, oblivious of the motion sickness. Two days later I was back, asking the shop-keeper if he had other books of this weird British writer able to put so much comedy and so much truth in apparently simple fantasy books. It was the beginning of a love story and today, many dozens of novels later, I consider Pratchett one of my favorite authors ever (up there with Camus, Borges, Tolkien and a few others). I hunted down my friends and infected them with the love for these witty books one by one. When I finished reading the books translated in Italian, I looked for French translations. The first book in English I read was one of Pratchett's. I could go on with many more anecdotes and stories about my love for Ser Terry, but it is not really what this post it is about. The purpose of this declaration of love was just to introduce the author and my fondness for his work. A few days ago, I stumbled upon an article on Eurogamer telling the story behind a particular Oblivion Mod which was co-created by Terry Pratchett itself. I knew that he was fond of video games and of modding, but nothing more. Turns out that he helped in the creation of one of the most interesting companions that one could have in The Elder Scrolls IV: Oblivion: Vilja, created by a modder named Emma who even voiced the many lines available for the character. Vilji herself is a rather interesting character ("Vilja in Swedish means willpower, guts, determination. And that is something Vilja has got lots of!" claims her description) and has been developed to allow many different ways of interacting with her. "I wish to express my sincere gratitude to a Great Grandmaster in storytelling, Discworld author Terry Pratchett. Vilja's feature that immediately fascinated me, however is her lead-the-way function. Terry Pratchett specifically requested this function: he was suffering from Alzheimer's and he was starting to have troubles with his memory. Navigating dungeons and wilderness in the game was becoming a real challenge, so Emma, with the help of a fellow modder called Charles, worked hart to implement a function that enabled Vilja to guide the player towards the next mission. I had never thought of this issue, and I find this solution very elegant and empowering! Finding a way to help the players using only in-game elements while at the same time making the game more realistic? Seems pretty awesome to me. After a quick search, however, I discovered that Vilja has a granddaughter in Skyrim, created also by Emma and with all the functions of the old Vilja and a new story-line. 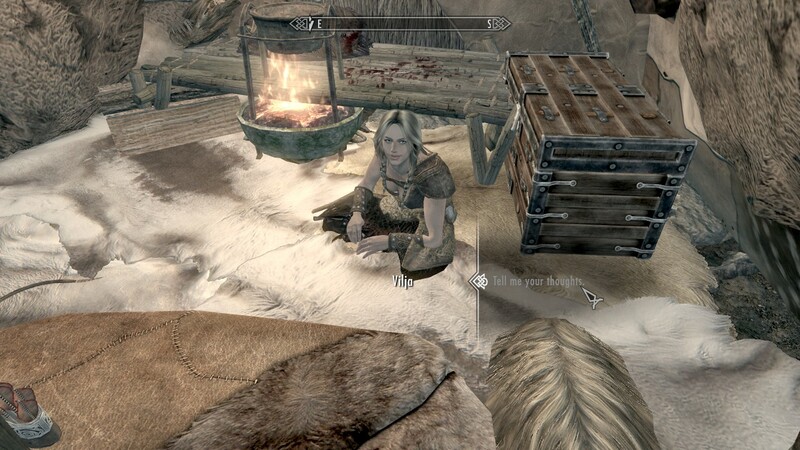 I downloaded the mod, made a new character, and went immediately to look for her. I have traveled with Vilja for a few hours, but I was captivated by this mod. Vilja is very talkative, funny and has lots of personality. Most of all, there are countless ways of interacting with her. We can ask her to talk more or to be quiet, to call her horse and ride, or to walk slowly, to help us find alchemic ingredients, to sing or just to chat a little with us. Despite of this, Viljia does not let us order her around and will be happier if we let her decide for herself a few things. The function I was most curious to try, however, was the lead-the-way one. Among the many options, I discovered that it is also possible to ask to Vilja to lead you to one of her favorite places, adding additional agency to the character. Curious, I immediately choose that option and Viljia started to walk down the road with my khajiit following her. After several wolves, some mercenaries, a necromancer and a couple of bandit, we had crossed half of Skyrim and arrived in one of Vilja's favorite spots. It was a long trip, but she was very talkative and of good company. When we arrived I asked her why did she like that place so much, and she described me the beauties of the view from that particular mountain. 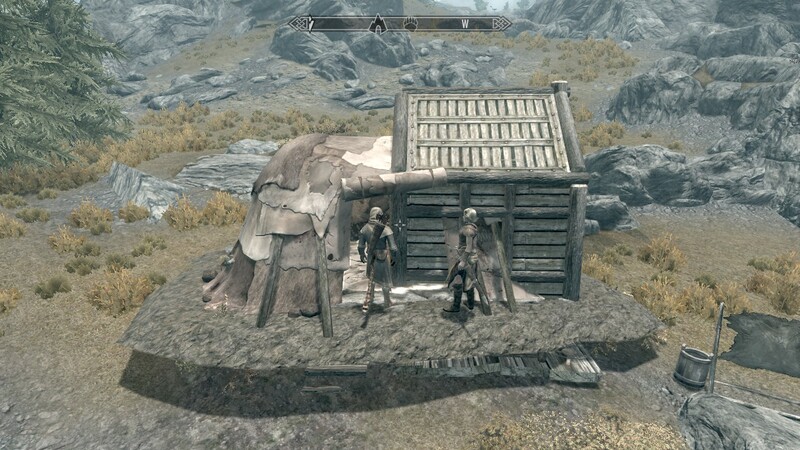 Also the best mods have their glitches! I did it again: I just forgot this blog for months while the many things of academic life overflew me like a high tide of paperwork. But I am here, now and - as every terrible ex has said at least once - this time will be different! Jokes aside, one of the reasons I neglected this blog for a while is that I just started a new, exciting, project: an EU-funded postdoc called ReCliam (check here the Facebook Page). It is a Marie Sklodowska Curie Action Individual Fellowship, an EU mobility program, which translates in a quite amazing thing career-wise (and also quite unexpected, tbo!) and it means that I had the occasion to move in a new, great (and brand new) university: Tampere University in Finland! The Uni is rather cool and the best thing is that I get to work with the Gamification Group, which is a very young, diverse, multidisciplinary and provocative research environment (really, check them out!). Nowadays, the idea that cities should not just be smart, but also playable is gaining more and more recognition. In addition to bottom-up, spontaneous activities of playful use of urban spaces (such as parkour, flash-mobs and zombie walks) and to urban games (the most famous being AR location-based mobile game Pokémon Go), pro-social activities such as those organised by Playable City at the Watershed of Bristol try to channel the power of city play and use it to promote more inclusive communities and a sense of city-ownership. The citizens' reaction to moments of urban playfulness is often the same: a simple, almost childish, joy at seeing the anonymity of modern cities being invaded by coloured, fun and light-hearted activities. Urban gamification, then, could be an effective strategy for helping those citizens that feel increasingly powerless and disconnected from their own cities in face of the changes brought by globalisation and by the ICT revolution: “Cities that play together stay together”. ReClaim aims at studying urban play in the wider frame of gamification, in order to deepen our understanding on how we can use play to affect the urban spaces and on what effects this might have on the citizens and their practices. The project draws from the knowledge and methodologies of gamification, critical design and pervasive play and aims at building an innovative and usable methodology. The latter will be tested through the analysis of case studies and through empirical testing, thus ensuring the building of a framework for the study and implementation of actions of urban gamification. At the end of the project, ReClaim will offer to designers, gamifiers and researchers a concrete and methodologically sound framework on how to use playfulness to make cities more liveable and inclusive. So stay tuned for more on ReClaim in the coming weeks! Last summer the prestigious annual conference of the Digital Games Research Association (DiGRA) took place in Turin, at my alma mater Università degli Studi di Torino thanks to the hard work of Riccardo Fassone. 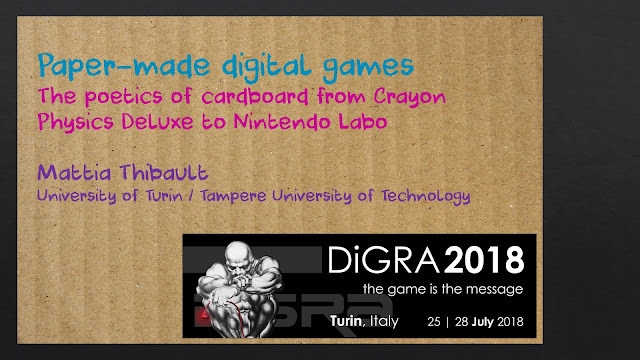 It was the first time that I attended a DiGRA. It was great to see new faces and meet old friends, but most of all I appreciated the variety of topics and perspectives presented: an (unnecessary) proof of the rich cultural reach of digital gaming. It was great also to be there with my dear friends Vincenzo Idone Cassone and Gianmarco Giuliana (see paper), both semioticians from CIRCe. Big conferences have often a liminal feel that makes them almost playful. This one in particular, as Erik Zimmerman engaged us in a few rather funny games at the end of the day. I presented an extended abstract on the poetics of cardboard, you can find it here. GamiFIN 2019 in Levi, Lapland. If you happen to be interested both in awe-inspiring Northern Lights and in understanding how play and games are influencing our culture and everyday life: look no further! You'll get the whole package by submitting a paper to GamiFIN 2019. 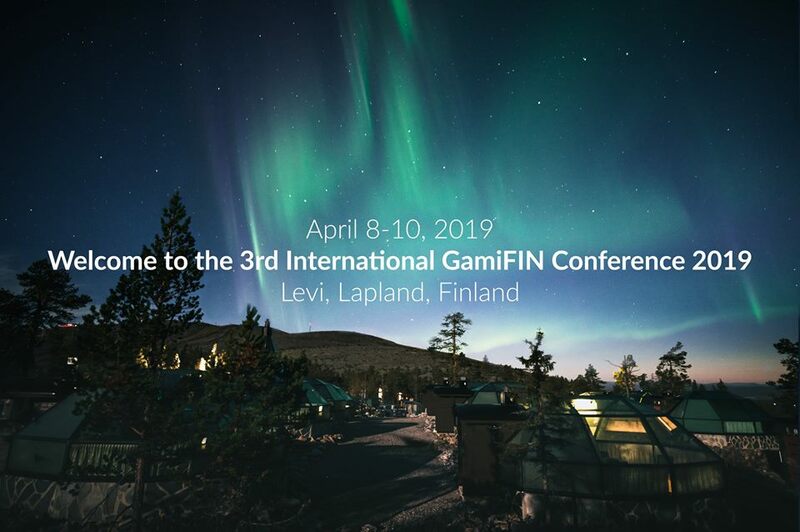 GamiFIN is a very Finnish, top-quality conference on gamification, this year at its 3rd edition - and you know how the saying goes: "third time's a charm". That is probably why this edition of GamiFIN won't be in the big southern cities of Finland, but up North, in the snowy region of Lapland, over the Polar Circle, in Levi. But don't worry! The venue is easy to reach and, no, you won't freeze to death: the conference is held in the comfortable Sokos Hotel up there. 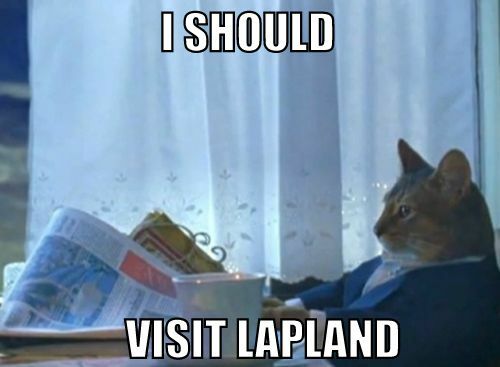 On the other hand, you will both get a chance to see the northern lights and to participate in a leading conference on gamification, where your work will gain visibility and you will be meeting other distinguished scholars. Not sold yet? What if I told you that GamiFIN also allows you to develop your paper towards the dedicated gamification minitrack at HICSS and special issues in journals such as Internet research and Electronic Commerce Research and Application. This means that GAMIFIN Coordinators will work hard to increase the predictability and rigorousness of the peer-review and publication process by providing a concise review continuum and discussion with peers . The conference will be held April 8-10, 2019, while the submission deadline is December 10, 2018. Check the Facebook event and see you in Levi! Ninjago and some strange affinities. I just saw The Ninjago Lego Movie. Although I enjoyed greatly both The Lego Movie and The Batman Lego Movie, this one wasn't great. It had some moments, but it felt pedantic and slow. 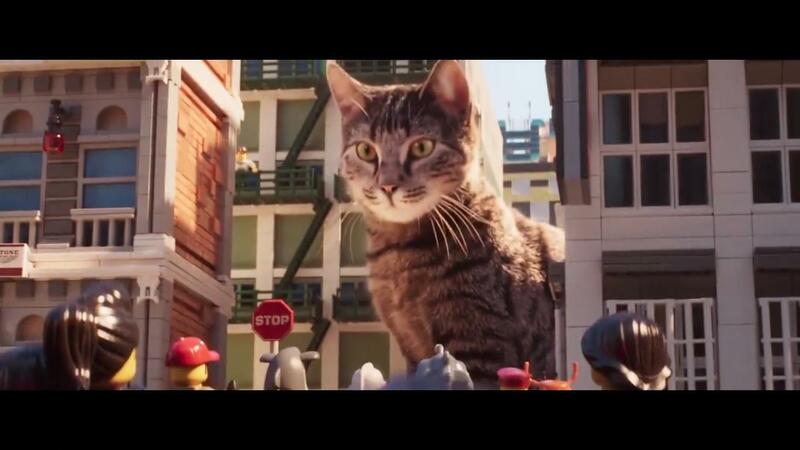 HOWEVER it ha a rather interesting feature: it put together three things I wrote about recently: cats (here), Lego (here and here) and east-west hybrid cities (forthcoming in a book edited by Bruno Surace and Frank Jacob). Fun. Here, have a cat pic. It took some time, but the book I edited with my pal Gabriele Marino is finally out! Ever wondered where memes come from and why they spread so easily online? Are you skeptical about the biological metaphors that we use to explain everything that is non-trivial in communication? (we certainly are!) Do you spend far too much time on 9gag or 4chan and you'd wish to pretend it's time well spent in some scientific endeavour? Look no further and read our multi-lingual, interdisciplinary, unmerciful, 550 pages-long issue of Lexia! Designing the Future: what Design Fiction can teach to Sustainable Design. 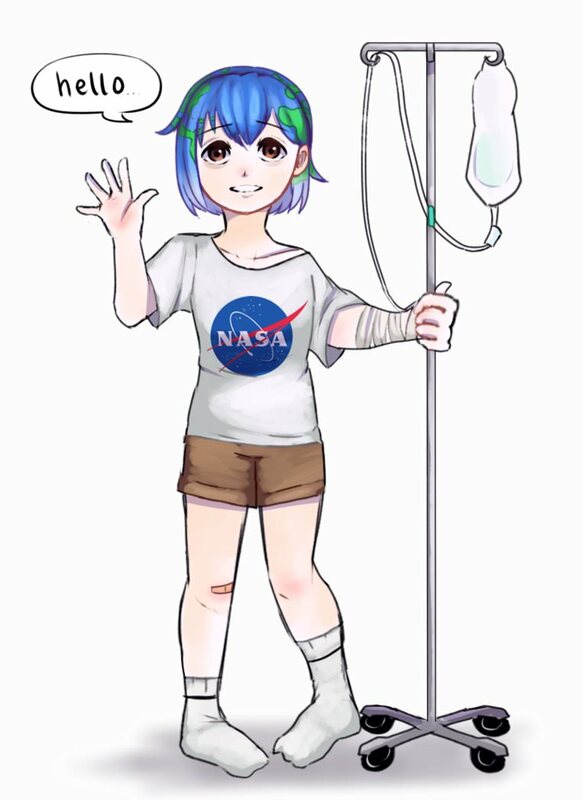 Earth-chan is in a bad shape. The anime girl with coloured hair and a NASA T-shirt represents our planet's dire situation and it's last call for help. all - asking internet users to do more recycling. 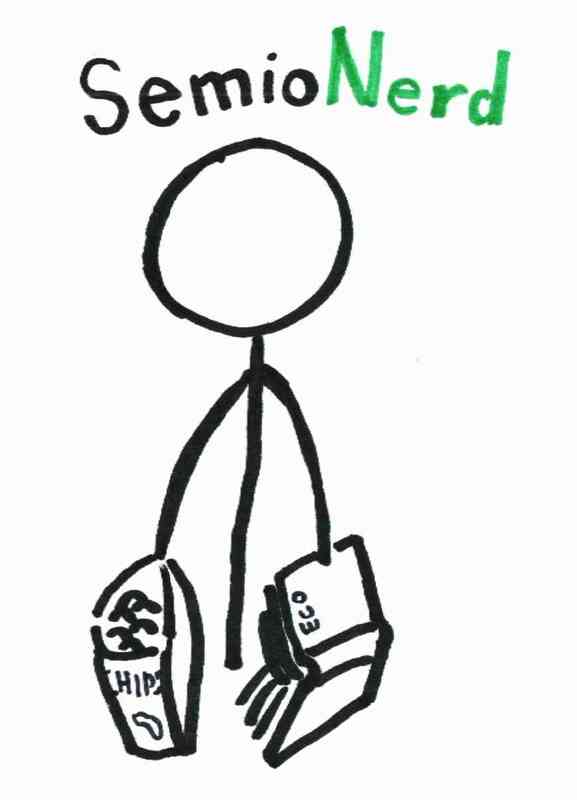 Recycling is indeed seen as a possible solution to prevent a planetary disaster without having to change our lifestyle. This year’s Dutch Design Week was crowded with Substainable Design projects dedicate to creatives ways of recycling - the theme of the event was "Good Design for a bad World". 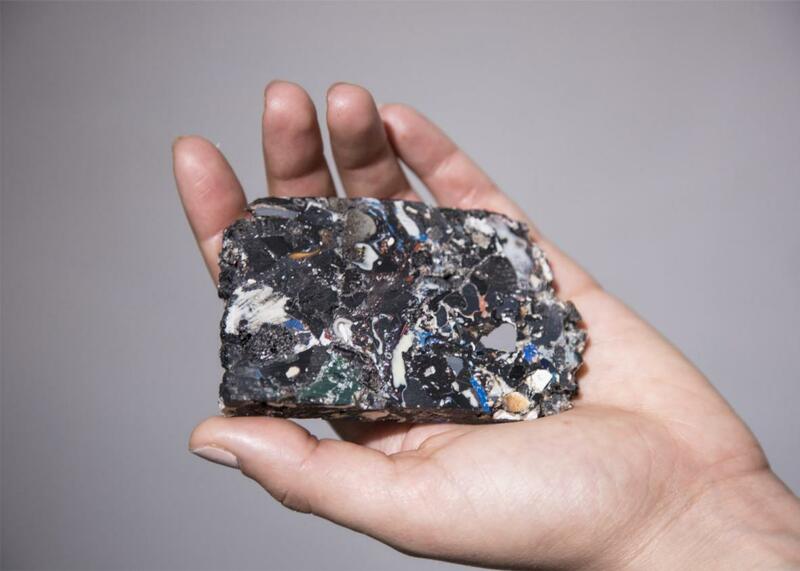 But are we really sure that we can design our way out of the consequences of human pollution? Shahar Livne's Desing Fiction project forces us to ponder on the irremediable changes that human life has already engraved on our planet. An article by Meg Chaltron appeared on Slate explains us why. Gamer, Nerd and Semiotician, I like to play games, analyse them, and annoy people talking for hours about my results. I'm a Postodc Researcher at Tampere University and a member of the Gamification Group.